I have been in business for over 30 years, specializing in original American and European ceramic tiles from 1650-1930’s, plus other great vintage items. 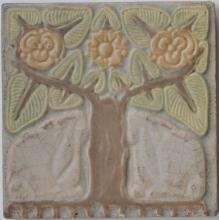 I keep a wide variety of tiles posted on my website page and add new items at regular intervals. I always try to have complete fireplace surrounds and an assortment that would work very nicely for kitchen and bath installations. Antique tiles work very nicely with new field tile and insure that you can have a truly unique installation. I am a member of the American Art Pottery Association, the Tile Heritage Foundation, and the Tile and Architectural Ceramics Society. I exhibit at select shows, including the National Arts and Crafts Conference at the Grove Park Inn each February.